The Last Day of School is now June 4th. Mechanical Maniacs Take Home First Place in Robot Design at First Lego League's Regional Championship! Mechanical Maniacs Head to Regionals! Congratulations to the Meadowmere Mechanical Maniacs for advancing to the First Lego League Regional Tournament for the 4th year in a row. Their performance at their qualifying tournament included a 1st place in Best Robot Performance and Best Project.
" We are so proud of how hard our kids worked. All of their work has paid off. 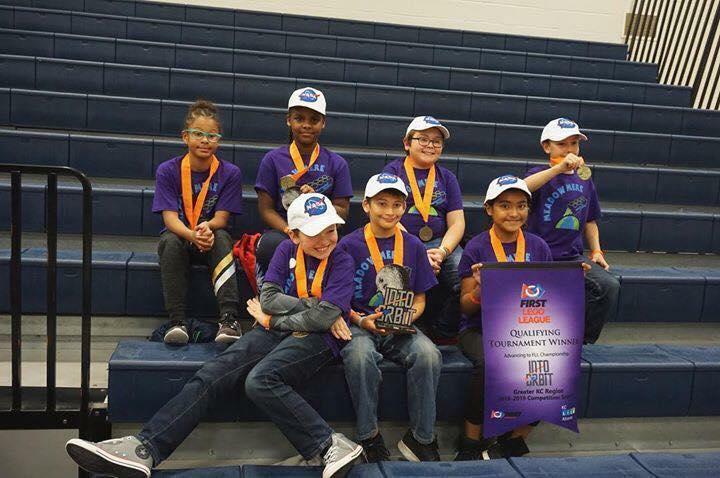 They now have their eye on the prize and are ready to take on Regionals for sure," said Mary Thacker, Lego League Coach. Major Saver is Coming in February! This year, the annual district fundraiser will take place from February 12th to February 26th. Arvest Bank made a visit to Meadowmere Elementary to surprise First Grade Teacher Mrs. E (Esfandiary)! Meadowmere is having an APEX Remix Fundraiser! Meadowmere is raising money for new risers, safety wall mats in the gym, and a new outdoor classroom! Meadowmere has started a chapter of WatchDOGS in our school.